This can not be used by GnuPlot. We have to cut needless characters. Number in bold black is number of seconds between measurements. Now you can run this script in background. There will be a new file "temp.dat" containing complete temerature history. Because this file is containing complete history, before creating a graph, you have to make another file containing only temperatures from a single day. We can use a little advanced "grep" command. Do not forget to change path. This command will copy temperatures from previous day and paste them in new "temperature_temporary.dat" file. It was a long way, but now you have file with temperatures from previous day in format that GnuPlot can understand. Before you can try to plot first graph you have to insall "gnuplot" package. Paste this. It is configuration for GnuPlot. This scripts are ideal to use for daily plotting of temperature graph. So add these scripts to crontab. Now close file (CTRL+X...) and save changes (...press "y" and Enter). For changes to take effect, restart RPi. 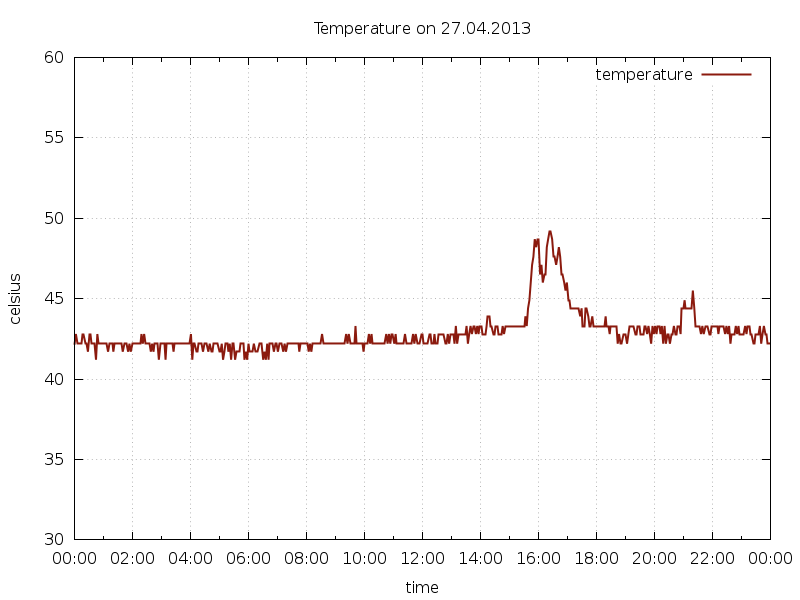 From now, everyday at 00:25 will be created nice graph with temperatures from previous day. Good idea is to place this graphs in webserver folder with enabled autoindex. Higher temperature at 16-17:00 is caused by sun shining directly on black SoC through window.